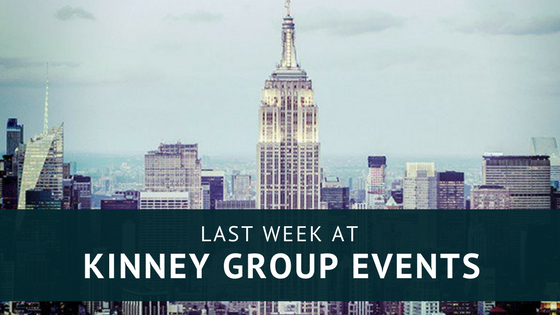 It was another exciting week at Kinney Group Events. We were able to help two long standing clients with their very different events. 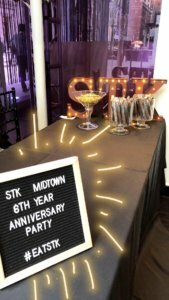 First, a celebration of the 6th Anniversary of STK Midtown on 6th Avenue. KGE has worked with STK many times over the last year, so when they contacted us about helping with their anniversary party, we were all in! And when the time to set-up finally arrived, we had all the special effects ready to go! Our techs made certain that all of the equipment that was needed to provide the right atmosphere was delivered to the site. In particular, a large confetti cannon was filled with custom-made black and gold confetti to be released at just the right moment. The use of “up lighting” that was installed around the room, helped to set the mood and tone for the event by using purple and blue-white lighting. 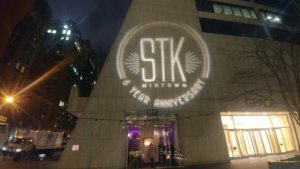 We also had a custom gobo (a dark plate or screen used to shield a lens from light) designed to display the STK logo on the wall inside, as well as on the face of the building on the outside. 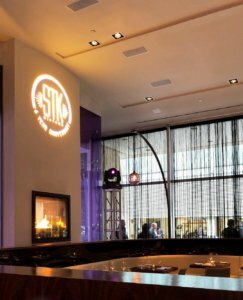 This event was a hit – from the moment you stepped in the door, until it was time to go – everyone had a great time celebrating STK! The next event was a Corporate Meeting for Equinox Fitness, held at the Redbury New York Hotel on East 29th Street. We have worked with this client many times in the past and wanted to make sure that this meeting came together very well. 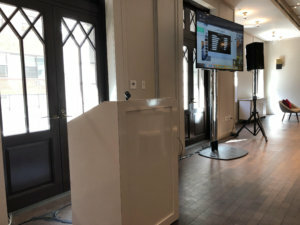 The room was set-up with (2) 70” screens, speakers and a podium with a wireless mic in the center. The VP’s of Equinox were able to take turns going to the mic and speaking about different aspects of the company. The meeting was also recorded and a live stream provided for guests who were present nationwide. 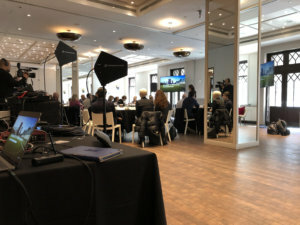 Each person that attended was able to view the speaker, as well as see the presentation on the (2) large screens we provided. Our tech made sure that the live stream went smoothly and the meeting was a success!